Home > English > Afghanistan News > Genocide of the Hazaras: hundreds killed and injured in Quetta! Genocide of the Hazaras: hundreds killed and injured in Quetta! 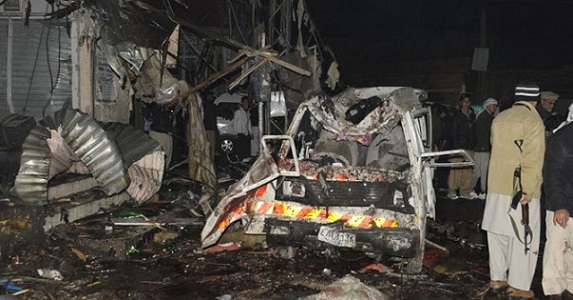 The worst violence occurred in the southwestern city of Quetta, where two explosions a few minutes apart in the evening ripped through a snooker hall in a neighborhood dominated by ethnic Hazara Shiites, killing at least 81 people and wounding more than 170, the police said. ISLAMABAD, Pakistan — Bomb blasts in two Pakistani cities killed at least 115 people on Thursday and wounded more than 270, offering harrowing evidence of how the country’s myriad internal conflicts could destabilize it as elections approach. A suicide bomber detonated his explosives inside the hall, and a second attacker then blew up his vehicle outside the club as police officers and journalists arrived, a senior police officer, Mir Zubair Mehmood, told reporters. Five police officers and one camera operator were killed in the second explosion. Hospitals were overwhelmed as casualties arrived through the evening. Hazara leaders said it was the worst sectarian attack in Quetta since attacks on their community started about 14 years ago.